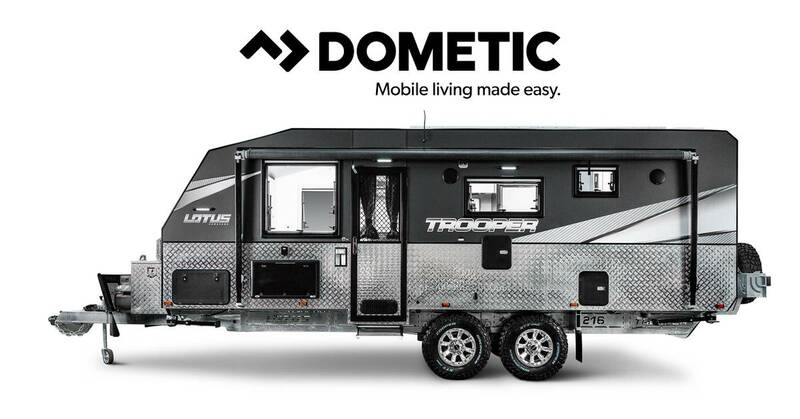 Since the very beginning, Lotus Caravans have been working with the folks at Dometic. We, like millions of other people, trust and use their products every day because they are world leaders in the RV industry. We’ve really enjoyed working with the team at Dometic because we share similar values in always striving to improve our products and ensure we are providing the best products partnered with great service. Their mission of ‘Mobile Living Made Easy’ combined with their promise to deliver ‘smart and reliable products with outstanding design’ is what keeps us coming back to them with every new van that we build. Each of their products go through rigorous research and testing right here in Australia before they even end up in a Lotus Caravan. They’ve got the credentials to back up their products too, with over 50 years of experience behind them and award-winning products like their CFX range of portable fridges. Dometic really takes care of Lotus Caravans’ customers as well. If there’s ever any trouble, Lotus Caravan owners get access to the online warranty registration program, Dometic Care. This keeps the service process running smoothly so you can spend less time finding service and get back on the road quicker. As part of the Dometic Care program, Lotus Caravan owners can also purchase an extended warranty on selected Dometic RV Products. If you need any support from the team at Dometic you can jump onto the Dometic website, it’s full of useful resources with FAQs, user manuals, catalogues or you can simply submit a support form or call 1800 21 21 21 for more information.